The world famous tomb of Tutankhamun was thrust into the spotlight like never before, ever since Dr Nicholas Reeves published a paper titled The Burial of Nefertiti? in August 2015. Based on ultra-high-resolution images of the tomb shared online by Factum Arte – a Spanish group that specializes in the replication of art works globally – the British Egyptologist proposed a theory that tomb KV62 was actually a double-burial. None other than the enigmatic Amarna queen, Nefertiti, lay behind the north wall, he posited. But it hasn’t been smooth sailing for the project ever since; with subsequent scans differing in their results and investigations virtually grinding to a halt. Now, Italian researchers have been authorized by the Egyptian government to conduct geo-radar studies inside the boy-king’s crypt. The world waits with bated breath for the final word in this long-drawn saga. Detail of what is undoubtedly the world’s most famous painted stucco-coated limestone bust. Queen Nefertiti, the ‘Great Royal Wife’ of Akhenaten was one of the most powerful women in her time. It is suggested that she co-ruled with her husband, and possibly, independently upon his death. Egyptian Museum, Berlin. In early November 2015, it was revealed that infrared scans had detected a possible hidden chamber behind the north wall of Tutankhamun’s tomb, which is situated in the central Valley of the Kings. These tests, conducted by Japanese radar specialist Hirokatsu Watanabe, suggested the “presence of metallic and organic substances” amidst declarations that what lay beyond “could be the discovery of the century.” Aided by state-of-the-art 3D scans produced by Factum Arte, leading Egyptologist Dr Nicholas Reeves made a stunning proposal that KV62 was a double-burial; and added that a burial chamber and storeroom lay behind the sealed, plastered, and painted doorways of the northern and western walls of the tomb. But most fellow-Egyptologists were unwilling to accept these “findings” at face value. They sought more data and demanded that the survey results be peer-reviewed, before any conclusion could be arrived at. Soon, the initial euphoria among the general public too made way for doubts, and amidst an avalanche of criticism that Dr Reeves calmly took in his stride – for he had said right at the start: “If I’m wrong I’m wrong, but if I’m right this is potentially the biggest archaeological discovery ever made” – the theory appeared to fizzle out. Scans conducted thereafter by National Geographic were said to have yielded inconclusive results; but these were also not made available to experts. However, this was not the final verdict. From the outset, Dr Zahi Hawass, former Secretary General of the Supreme Council of Antiquities, remained unconvinced with the ‘Tutfertiti’ theory, “Howard Carter worked in the tomb for ten years. I am sure he was looking everywhere to see if these walls were solid or if there was something behind them. We always do that when we discover a tomb. Otto Schaden, when he found KV63, examined every place in the tomb to see if there were more rooms. This is why I believe that Carter did the same, and he was not able to see anything that was hidden. I also think that he removed the plaster from the niches that held the magical bricks. That would have indicated if there was anything behind the walls, because the plaster had been removed.” While this is true, we must bear in mind that Carter could not have done much given the limited scientific techniques at his disposal back then. When one studies the depictions of Nefertiti it is obvious that she held considerable clout in the Amarna court. She possibly shared the responsibility of governing Egypt alongside her husband, Akhenaten. 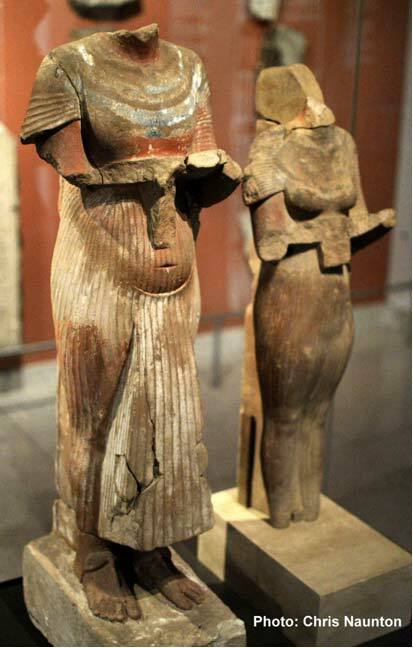 These battered, painted statues of the couple were discovered by Sir Flinders Petrie in Tell el-Amarna. Ashmolean Museum, Oxford. British Egyptologist, Dylan Bickerstaffe, published an engaging and comprehensive Paper titled, Did Tutankhamun Conceal Nefertiti? in which he carefully analyzed every claim Reeves proposed; and his meticulous study offered evidence to the contrary: “In support of the existence of an additional side chamber in KV62 Reeves points to the fact that King’s Valley tombs of the later 18th Dynasty appear to have aimed to have four such side chambers, ideally one at each end of the Burial Chamber, and one on each side of the Antechamber. Thus, this arrangement, which was initiated by Amenhotep II in KV35, was continued by Thutmose IV in KV43, and developed by Amenhotep III in WV22, and Horemheb in KV57. The development in the two latter cases is that an additional side chamber was added to the Burial Chamber and that one or two of these side chambers were extended to form burial suites for family members. As Reeves notes, the fact that the Entrance Passage of Tutankhamun’s tomb met the side of the Antechamber, rather than the end, meant that there were never likely to have been more than three side chambers in KV62. “Reeves’ putative discovery thus raises the side chamber tally in KV62 to the maximum possible, with the acknowledged possibility that the west wall might not simply conceal another storage chamber, but a burial suite for Amarna royalty, perhaps displaced from tombs at Amarna itself. However, … it should be acknowledged that Tutankhamun’s tomb came after that of Akhenaten at Amarna (TA26), which only had a single side room opening off the Burial Chamber area (and made provision for other family members in suites opening from the right of the entrance passage); and was followed by the tomb of Ay (WV23) which also had just one side chamber opening from the Burial Chamber.” Also, based on the right-hand turn that leads to the Burial Chamber, Dr Reeves postulated that KV62 was built for a female ruler, namely, Nefertiti. But this suggestion that all male royal tombs of the Eighteenth Dynasty show a left turn while Tutankhamun is unique in having a right turn, indicating an original female owner, is not quite true as observed by many scholars. There are a number of examples where the opposite is the case: the sepulcher of Thutmose I (KV38), the combined tomb of Thutmose I and Hatshepsut (KV20), the crypt of Aye (KV23), the straight line design of KV55, the tomb of Horemheb (KV57) which indicates a distinct change in the design of royal tombs that carries on into the Nineteenth Dynasty with Ramesses II (KV7). Further, Hatshepsut Meryet-re’s (the wife of Thutmose III) cartouche shaped Burial Chamber (KV42) is aligned to the left in her tomb—and she was, of course, an Eighteenth Dynasty royal female, which also tends to question Reeves’ claim. “It should be noted that a right-turn into the burial area is not exclusively the preserve of ‘female’ tombs” explains Dylan. 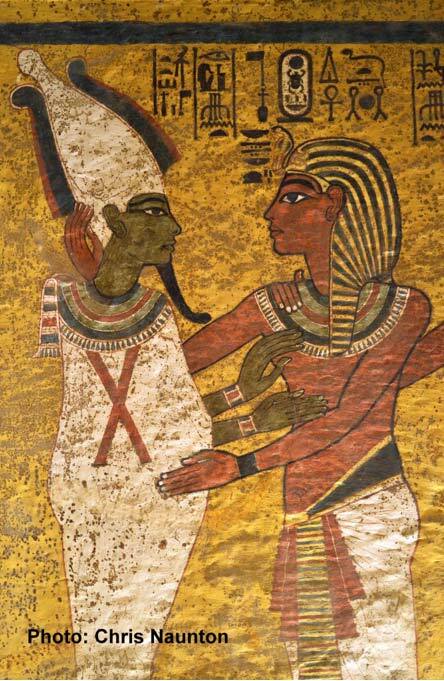 In the final scene on the north wall, Tutankhamun is shown wearing the nemes headcloth followed closely by his Ka (not in picture), as Osiris welcomes him into the Netherworld with an embrace. The quasi-royal design of Tomb 26C within the Communal Tomb in Amarna (TA26) points to Nefertiti as its intended owner. The entrance to the suite of unfinished chambers suggests the Heretic’s wife was never buried here. Sometime around 1330 B.C., Nefertiti who along with her heretical husband was at the vanguard of promoting Aten worship, and had supposedly played a pivotal role in the politics of the time, disappeared without a trace. The only thing we are certain about is that her intended resting place in the ancient royal capital Akhetaten lies battered and unfinished, clear signs it was never occupied. Not a single funerary item from her burial has ever surfaced. 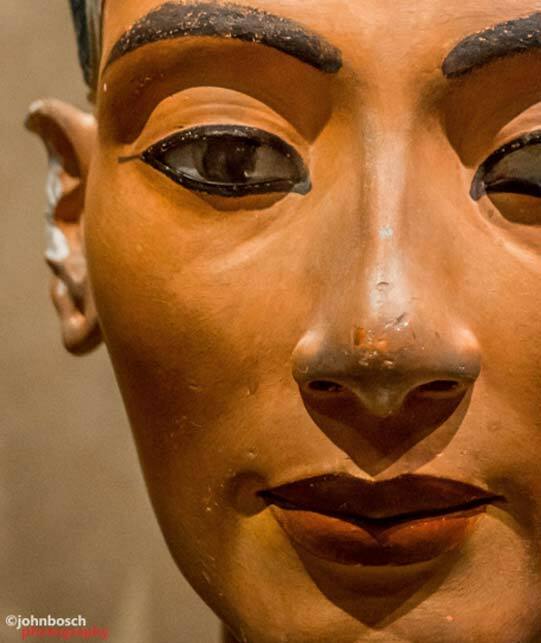 Where then was this enigmatic queen buried—and is Dr Nicholas Reeves right in pointing to KV62? Egyptologists have for long recognized that Tutankhamun’s tomb contained a few intrusive objects; but the extent of the recycling now appears to be more than previously assumed; and for the reason that the evidence of reuse has in most cases been adeptly concealed. Based on the existence of these palimpsests and indications of reuse, a section of scholars postulate that many items in the boy-king’s core funerary equipment were prepared primarily for Pharaoh Ankhkheperure Neferneferuaten. (Clockwise from Left) Limestone fragment with cartouche of Neferneferuaten Nefertiti ( public domain ); Terracotta mold seal with the birth name of Tutankhamun, dated to after the restoration of Amun worship ( public domain ); A terracotta mold with the throne name of Smenkhkare (public domain ); Clay jar seal with Akhenaten’s name stamped four times ( public domain ); and, Terracotta mold with the cartouche of Akhenaten. Los Angeles County Museum of Art (public domain ). d)A number of pectorals (Obj. Nos. 261 p(1), 261 p(3), etc. In fact, even Tutankhamun’s tomb seems to have been usurped from another owing to his untimely death. Dwelling on the floor plan of KV62, Dr Marianne Eaton-Krauss maintains that structural indications reveal additions were made to the original, single chamber (Antechamber only) to include the Annexe, Burial Chamber, and Treasury. “The tomb which Carter discovered in 1922, KV62, was not originally intended for Tutankhamun’s interment – nor, for that matter, for the burial of any pharaoh. Its plan does not meet the requirements for a king’s tomb that had evolved from Thutmose III’s reign down through the time of Amenhotep III, and which the Royal Tomb at Amarna also exemplifies. Instead, KV62’s original plan conformed to the modest type of tomb suitable for lesser members of the royal family – kings’ sons and daughters, as well as wives – given burial in the Valley of the Kings during the Eighteenth Dynasty,” she elucidates. This solid gold ring was found at Amarna. The hieroglyphs may be read as an ideogram; with the two seated figures - Akhenaten (left) and Nefertiti (right) - as the deities Shu (air as indicated by the feather he holds) and Tefnut (moisture). Metropolitan Museum of Art , New York. Dylan Bickerstaffe agrees and states, “It was thought that Tutankhamun intended to be buried elsewhere – perhaps in TA27 or TA29 at Amarna; and perhaps, following the return to Thebes, in WV23, the tomb later occupied by Ay. In which case the question is: who was KV62 originally intended for? There are similarities in design to the King’s Valley tomb of Yuya and Thuya (KV46), and it is therefore not impossible that it could have originally been intended for an Amarna woman, perhaps even Nefertiti. Tutankhamun was buried in front of the scenes on the north wall, so there is no reason why Nefertiti, Meritaten, Baketaten, or anyone else, should have needed to be buried behind these scenes – which, after all, are not quite like the scenes which occupied the far side of well shafts in other 18th Dynasty royal tombs, having the additional opening of the mouth scene. Indeed, it this specific scene which Reeves says betrays evidence of adaption from a previous owner, and it is curious that the area around this also has the greatest concentration of mould spots.” The out-of-place and non-traditional 20-square “Amarna grid” depicted on the north wall aside, Dr Reeves created quite a stir when he claimed that the figure who is shown performing the Opening of the Mouth ceremony is not Pharaoh Aye as has traditionally been believed, but Tutankhamun himself carrying out the ritual for the deceased Nefertiti. The author expresses his gratitude to Dr Nicholas Reeves and Dylan Bickerstaffe for allowing the use of select extracts from their academic papers. 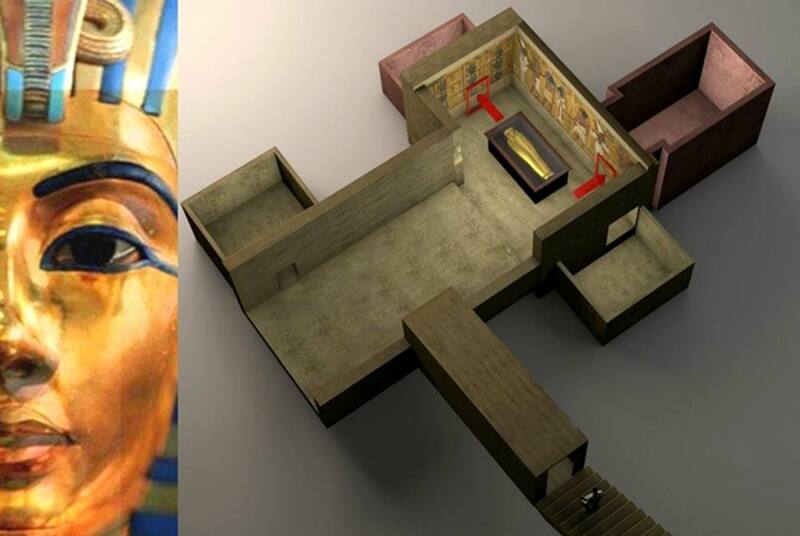 Top Image: Superimposed photo of Nefertiti’s bust on Tutankhamun’s mask; and artist’s rendering of the proposed rooms behind the KV62 burial chamber; design by Anand Balaji (Photo credit: Roy Lester Pond and Anand Balaji/Deposit Photos); Deriv. Independent researcher and playwright Anand Balaji, is an Ancient Origins guest writer and author of Sands of Amarna: End of Akhenaten. I have wondered about the size of Tutanhkamun’s tomb. It has always seemed particularly small in comparison to other tombs of the period, despite the “prepared in a hurry” explanation. If you stop to consider the turmoil which must have been in place when the Pharaoh died at the age of 19, without leaving an heir, the idea of a double burial with his stepmother does not seem so far fetched (fetched maybe, but not far fetched). I can see a scenario where the burial detail says “Crap, we have 90 days to build a tomb fit for the Pharaoh? I know let’s take Mom’s tomb, add a couple of rooms, shove her to the back (or side) and presto we have a tomb for him.” or words to that effect. Tut was not a particularly important king. He had not really had time to come into his own, ascending at age 9 and dying at 19. Because of his early and unexpected death many of his grave goods were recycled (including perhaps the famous death mask) so why not the tomb as well?